Since Russia’s 2014 invasion of Ukraine, U.S.-Russian relations have deteriorated dramatically. A Russian violation of the Intermediate-Range Nuclear Forces (INF) Treaty has put that treaty at risk and the nuclear arms reduction dialogue remains stalled. As a result, each side still can deploy a whopping 1,550 strategic nuclear warheads, as allowed by New START. Reliance on outdated launch-under-attack policies means that either leader at any moment can launch as many as 800 city-destroying nuclear weapons within about 20 minutes of a “go” order. Each side would have hundreds more nuclear weapons available in reserve for counterstrikes. The result would be a global catastrophe. Clearly, it is vital that the world’s two largest nuclear-armed powers pursue further measures to reduce their bloated stockpiles and the risk of a nuclear confrontation. Yet, Moscow’s brazen effort to interfere with the 2016 U.S. elections on behalf of the Trump campaign and suspicions that then-candidate Donald Trump encouraged that effort have further complicated the bilateral relationship and cast doubt on Trump’s ability to deal with Putin. In little more than two years, on Feb. 5, 2021, New START is scheduled to expire. Without a decision to extend the treaty, which is allowable under Article XIV, there will be no legally binding limits on the world’s two largest arsenals for the first time since 1972. The risk of unconstrained U.S.-Russian nuclear competition and even more fraught relations would grow. In a March interview with NBC News, Putin voiced interest in extending New START or possibly even making further cuts in warhead numbers. In April, the Trump administration announced it is conducting a “whole-of-government review” on whether to extend New START, an effort described as still in its early stages. Even the toughest Democratic critics of Trump’s Russia policies support New START extension. Legislation introduced in June by Sens. Bob Menendez (D-N.J.), Jack Reed (D-R.I.), and Mark Warner (D-Va.) calls for extension of the treaty so long as Russia remains in compliance. To do so, Trump and Putin should relaunch the strategic stability dialogue and commit to reaching an early agreement to extend New START. If not, an even more dangerous phase in U.S.-Russian relations may emerge. Read more about Can the U.S. and Russia Avert a New Arms Race? A Japanese diplomat envisions ways to handle differences in order to protect and advance arms control efforts. 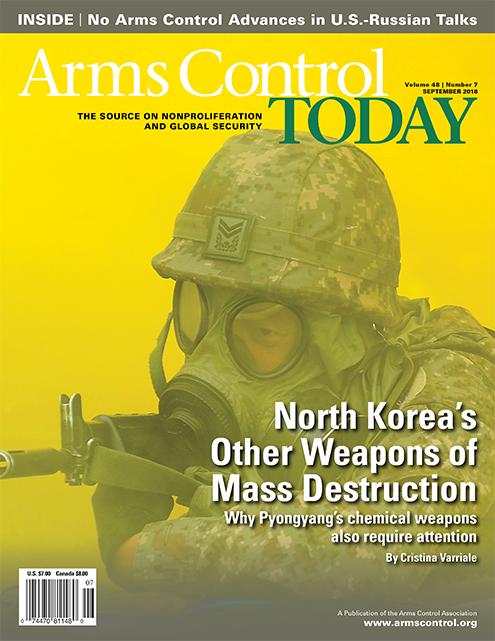 The capabilities of regional bodies bolster global counterproliferation efforts. The nuclear disarmament and nonproliferation regime is facing stress and pressure from all sides. A warning from a former head of the International Atomic Energy Agency. Most people and governments might agree that the current global quantity of 15,000-plus nuclear weapons and the current global level of annual military expenditures of some $1.7 trillion are tragically excessive. Yet, much of the world is currently engaged in arms races. Even heaven is not left in peace. Outer space is already “a war-fighting domain” filled with satellites, and many can be mobilized for war. Low-level cyberwar is already here. Nuclear weapons, “Star Wars,” and missile shields are again in focus. In 2009, President Barack Obama and Russian President Dmitry Medvedev declared in London that they would work for a total elimination of nuclear weapons. Today, there is no trace of such negotiations. Rather, several states, notably the United States and Russia, keep reminding the world of their arsenals. At the 2020 review conference of the nuclear Nonproliferation Treaty, nuclear-weapon states-parties will no doubt argue that a step-by-step approach is the only practical way to disarmament. Non-nuclear-weapon states will remind us that step-by-step action has been urged for 50 years with meager results. Now it is practiced—backward. The stocks of nuclear weapons still suffice to end human civilization in a quick suicide, while we have added the risk of a slow suicide through global warming. Some claim that nuclear weapons have helped to prevent armed confrontations. They point to the Cuban missile crisis in 1962, when the fear of a nuclear exchange made the United States and the Soviet Union shy away from war and agree to a diplomatic solution. Others remind us that, on a number of occasions, misunderstandings and mistakes nearly caused nuclear exchanges and that only luck saved the world. Last year, frustration among non-nuclear-weapon states and civil society led to the negotiation of a treaty comprehensively prohibiting possession and use of nuclear weapons. As none of the states possessing nuclear weapons will adhere to the treaty, it will not lead to nuclear disarmament. Indeed, some of them are so opposed to the treaty that they seek actively to dissuade other states from joining. The main political aim of the treaty, perhaps, is not the unrealistic one to achieve nuclear disarmament, but rather to further delegitimize nuclear weapons and thereby add restraints to their use and strengthen a nascent general norm against use. What restraints? The first restraint undoubtedly flows from the fear that an attack with nuclear weapons may lead to a retaliatory nuclear strike and mutually assured destruction or unacceptable devastation. This restraint and the stigma attached to any nuclear weapons use no doubt continues to weigh heavily on military planners. From time to time, military officials are heard to voice doubts that they can seriously plan for the use of nuclear weapons. Perhaps recent proposals to introduce new types of smaller nuclear weapons are advanced in view of a perceived reduced credibility of the old nuclear weapons. Yet, low-yield, “more useable” nuclear weapons would not be fit for the possibly legal use citing the “extreme circumstance of self-defense” to which the International Court of Justice has referred. They would be battlefield weapons with a lower threshold for use. They deserve to be opposed and discredited. From this viewpoint, the 2017 Treaty on the Prohibition of Nuclear Weapons was timely and welcome. Hans Blix was director-general of the International Atomic Energy Agency from 1981 to 1997. This column is adapted from his May 28 lecture, “Is the World on the Road to Peace or War?,” to the Stockholm International Peace Research Institute in Stockholm. U.S. sanctions on Russia for its use of the nerve agent Novichok in an alleged UK assassination attempt took effect in late August, and the Trump administration faces a legal deadline to impose still harsher measures in November. U.S. exports to Russia related to national security are banned under the initial sanctions, including gas turbine engines, electronics, integrated circuits, and testing and calibration equipment that were previously allowed on a case-by-case basis. Waivers may be issued for some exports related to space flights and commercial passenger safety. The United States and United Kingdom say Moscow was behind the poisoning in March of former Russian spy Sergei Skripal and his daughter with the Russian chemical agent in Salisbury in March. (See ACT, April 2018.) “The attack against Sergei and Yulia Skripal in Salisbury on March 4, was a reckless display of contempt for the universally held norm against chemical weapons,” said a spokesman for the White House National Security Council, according to Reuters. Many of the goods sanctioned in August were already banned by military- and security-related sanctions, but the United States in November likely will impose more powerful sanctions. Under the law, Russia will face additional penalties unless it provides reliable assurances that it is no longer using chemical weapons, will not do so in the future, and will allow international inspectors to verify its assurances. Russia is unlikely to comply with these demands given its repeated denial of use or recent possession of chemical weapons. Some options for additional sanctions include targeting multilateral bank assistance to Russia, U.S. bank loans to the Russian government, or aircraft landing rights. In an Aug. 10 phone call with U.S. Secretary of State Mike Pompeo, Russian Foreign Minister Sergey Lavrov again denied his country’s use of chemical weapons and rejected the sanctions, according to the Russian Foreign Ministry. Russia will “consider countermeasures to this most recent unfriendly move by Washington,” Foreign Ministry spokeswoman Maria Zakharova said Aug. 9.